Materials: oil on panel. Dimensions: 38.5 x 49.5 cm. 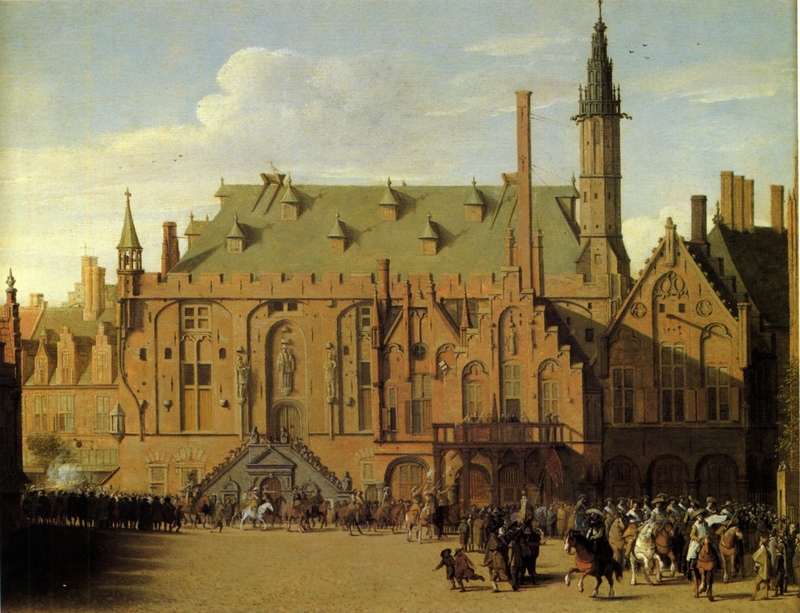 Source: http://www.sightswithin.com/Pieter.Jansz.Saenredam/The_Town_Hall_of_Haarlem_with_Prince_Maurits_Replacing_the_Town_Government.jpg. I have changed the light, contrast and colors of the original photo. Gezicht op het oude stadhuis aan de Dam te Amsterdam. In de galerij van de vierschaar en voor het gebouw enkele personen. Rechts enkele winkeltjes (http://www.rijksmuseum.nl/collectie/zoeken/asset.jsp?id=SK-C-1409&lang=en). This superb panel is illustrative of the innovative approach adopted by the Dutch artist Pieter Jansz Saenredam, who was the first architecture painter to represent existing buildings using a peculiar new working method. First, he would take measurements and make sketches of buildings on site; these would then be used to produce detailed construction drawings in the studio. Finally, after several years, he would complete the oil paintings, transferring his delicate drawings to the appropriate support. In this way Saenredam sought to create impeccable portraits of buildings, though his quest for perfection occasionally led him to modify reality. The solid, monumental quality of his work is conveyed through simple, bright architectural settings and the use of a palette of pale colours for lighting purposes (http://www.museothyssen.org/en/thyssen/ficha_obra/202).